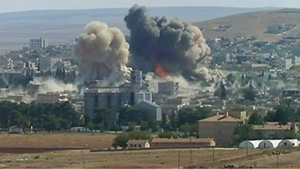 As the battle for the tiny Kurdish enclave in Kobane goes into what could be its final phase, and the US-led coalition steps up its air campaign against the so-called Islamic State (ISIS) in Syria, serious questions are being asked about the legality and legitimacy of intervention and about what all this means for the Responsibility to Protect (R2P). Several prominent commentators have argued that the airstrikes in Syria are illegal because they have not been authorized by the UN Security Council and are not acts of self-defense because ISIS poses no direct threat to the US. But this rests on a mistaken view of the scope of self-defense enshrined in the UN charter. Article 51 of the charter notes the “inherent right” of states to “individual or collective self-defense” (emphasis added). In other words, not only does the government of Iraq have a right to use force to defend itself against ISIS, other states have a right to assist it, as Jason Ralph has pointed out. The absence of a direct threat to the US or its allies does not, therefore, invalidate self-defense as grounds for intervention, because actions against ISIS in Syria are essentially a defensive response to that organization’s armed aggression against Iraq. Indeed, this was precisely the argument US officials employed. While there may be some legal squabbling at the margins, it appears from the international response to the intervention that this is a justification broadly accepted by most member states. The legal and political case is buttressed somewhat by the position of the Syrian government—though only at the cost of additional complications. Although the US and its allies have gone out of their way to emphasize that they do not need and have not sought the formal consent of Bashar al-Assad’s government for fear of lending legitimacy to a regime responsible for widespread and systematic crimes against humanity, it is evident from both the Syrian government’s statements and its actions that the mission against ISIS enjoys its consent. Not only has the government offered formal consent, it is also cooperating with the US-led effort by standing down its air defenses in the relevant areas of operation. This in itself implies that the US and Damascus are sharing operational information. International law permits states to invite military intervention onto its territory, and the Syrian government’s statements and actions lend further legal weight to the intervention. It has also helped politically, moving Russia from a position of outright opposition to intervention without a UN Security Council resolution in mid-to-late September to one of ambivalence today. While Moscow would prefer to see Syria invited to grant formal consent, it seems to be satisfied that the government is supportive. Of course, all this raises difficult questions about the extent to which the US and its allies are now actively supporting a regime responsible for untold atrocity crimes against its own population. This is a particular problem for efforts to fulfill the Responsibility to Protect (R2P), since action that degrades ISIS will necessarily embolden the Syrian regime. It is important to be clear-eyed about some of the potential downside risks associated with this action. On the one hand, relieved of the need to commit forces to the war against ISIS, the Syrian regime will be free to commit greater resources to its campaign against the Free Syrian Army. On the other, any action that degrades the opponents of Damascus will necessarily strengthen the regime’s relative position. With its position strengthened, the regime will likely be less, not more, inclined to negotiate a settlement. As such, it is not surprising that there is no sign yet of any opportunities for a negotiated settlement and nor are they likely while the frontlines remain in flux. These are difficult and troubling questions, but perhaps the hard reality is that on this specific matter of the threat posed by ISIS to civilians, the interests of the Syrian government, the US-led coalition, and the protection of populations from genocide and other mass atrocities are temporarily aligned. Irrespective of the precise legal justifications for action, important as they are, those following the chaotic scenes in Kobane would be hard-pressed to claim that the US-led airstrikes were not supporting the goals of R2P. By degrading ISIS forces, the strikes have bolstered Kurdish efforts to protect their own and, at the very least, bought civilians more time to flee. This response may be much less than what is needed, may be motivated by a range of concerns of which R2P is just one, and may carry with it downside risks for the long term, but the time for perfect solutions is long past and the airstrikes are supporting frantic efforts on the ground to hold back the ISIS tide and protect Kurdish civilians. The US-led military intervention has sufficient legal justification and is making a direct contribution to the protection of populations in Syria from genocide and mass atrocities. Whether it will prove to be too little, too late remains to be seen, but the fate of many depends on the international community’s resolve in dealing with the ISIS threat.